Halloween is next Thursday, which means most (adult) celebrations will take place this weekend. Don't fret; it's not too late to put together a fun Halloween party. The trick to a last minute theme party is to stick to one color scheme and concentrate your decorations in one area. Don't try to turn your entire space into a haunted house; the results will likely be sparse and sloppy. Instead, focus on a single element that people will remember, such as the bar or place settings. I've rounded up some suggestions for a last minute Halloween cocktail party. These can all be found in common stores and don't require any special ordering. (Bonus: most items are on sale!) 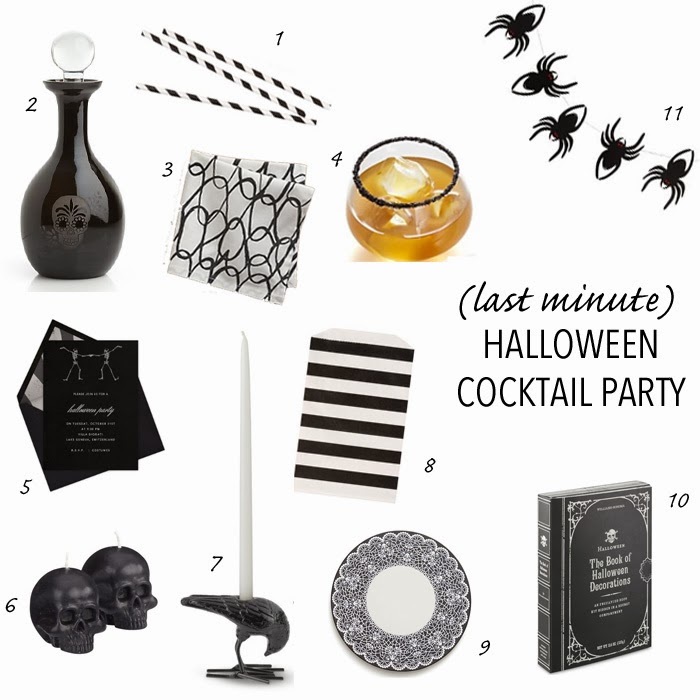 A black & white color palette is the easiest option for a last minute Halloween party, as you probably already have items in your home that you can incorporate.